October 2018 tested investors’ resolve and begs investors to question whether the diversification measures they have integrated into their portfolio construction, both at the asset allocation and underlying equity level will truly hold up amidst, what are likely to be, volatile times ahead. 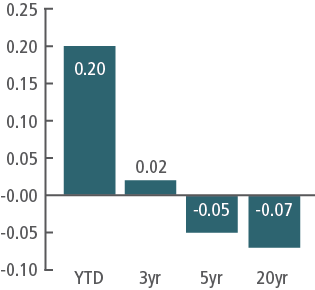 The traditional 60% Equity 40% Fixed Income portfolio (“60/40 portfolio”) realized its worst monthly loss, down -4.42%, since May 2010 as both equities and bonds depreciated during October. In the last twenty years, the 60/40 portfolio has only suffered a worse monthly decline in 8 of the last 240 months, less than 3% of the time. Traditional 60/40 Portfolio assumes 60% S&P 500 Index and 40% US Barclays Aggregate Index exposure with quarterly rebalancing back to strategic asset allocation targets. Source: Standard & Poor’s, Barclays Indices, eVestment. Stocks and bonds have historically realized a negative correlation; however since the Global Financial Crisis (“GFC”) correlations have gradually climbed, as both bonds and equities have risen in tandem. As the US begins to move from a quantitative easing to tightening interest rate environment, volatility has started to ripple through markets generating losses in both stocks and bonds and diluting potential diversification benefits. This leaves many to consider the portfolio implications as the long-term yin to yang of two complementary asset classes begins to fray. Source: Standard & Poor’s, Barclays Indices, eVestment. 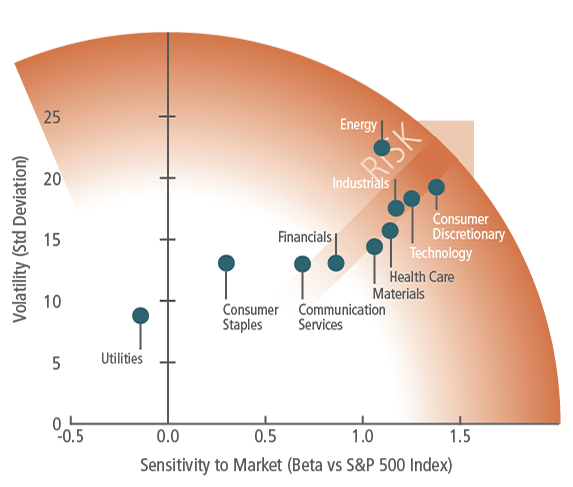 Furthermore, amid a trending and narrowly driven market, such as the one experienced post-GFC, many investors may find their portfolios have increased exposure to Growth/Momentum factors and underlying consumer-facing technology companies (housed within Consumer Discretionary, Telecommunication Services and Information Technology sectors). Taking on unintended risks increase a portfolio’s vulnerability to pronounced drawdowns as trends reverse. Factors such as High Dividend and Minimum Volatility and sector such as Utilities and Consumer Staples, which have lagged since the GFC, exhibited a significantly lower beta to the market and realized a lower standard deviation versus their cyclical counterparts. Factors represented by MSCI Indices and Sectors represented by S&P 500 Index GICs Level 1 Classification. Source: Standard & Poor’s, eVestment and Bloomberg. As a result, High Dividend and Minimum Volatility drew down roughly 60% less than Growth and Momentum Factors during October, while Utilities and Consumer Staples were the only sectors which realized positive returns for the month. As such, many investors have begun looking beyond the traditional 60/40 portfolio, both at the asset allocation level, considering exposure to truly uncorrelated return sources found within alternatives such as an Equity Market Neutral strategy, and within the underlying equity sleeve, considering the increasing beta, and volatility associated with certain factor and sector exposures. This material is intended for informational purposes only and it is not intended that it be relied on to make any investment decision. It was prepared without regard to the specific objectives, financial situation or needs of any particular person who may receive it. It does not constitute investment advice or a recommendation or an offer or solicitation and is not the basis for any contract to purchase or sell any security or other instrument, or QS Investors, LLC to enter into or arrange any type of transaction as a consequence of any information contained herein. QS Investors, LLC does not give any warranty as to the accuracy, reliability or completeness of information which is contained in this document. Except insofar as liability under any statute cannot be excluded, no member of QS Investors, LLC, the Issuer or any officer, employee or associate of them accepts any liability (whether arising in contract, in tort or negligence or otherwise) for any error or omission in this document or for any resulting loss or damage whether direct, indirect, consequential or otherwise suffered by the recipient of this document or any other person. The views expressed in this document constitute QS Investors’ judgment at the time of issue and are subject to change. The value of shares/units and their derived income may fall as well as rise. Past performance or any prediction or forecast is not indicative of future results. This document is only for professional investors. 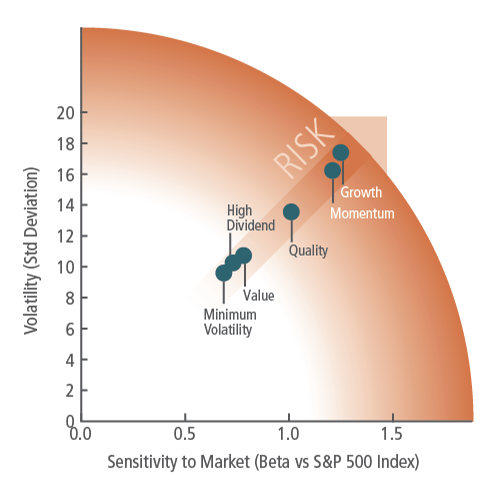 Investments are subject to risks, including possible loss of principal amount invested.